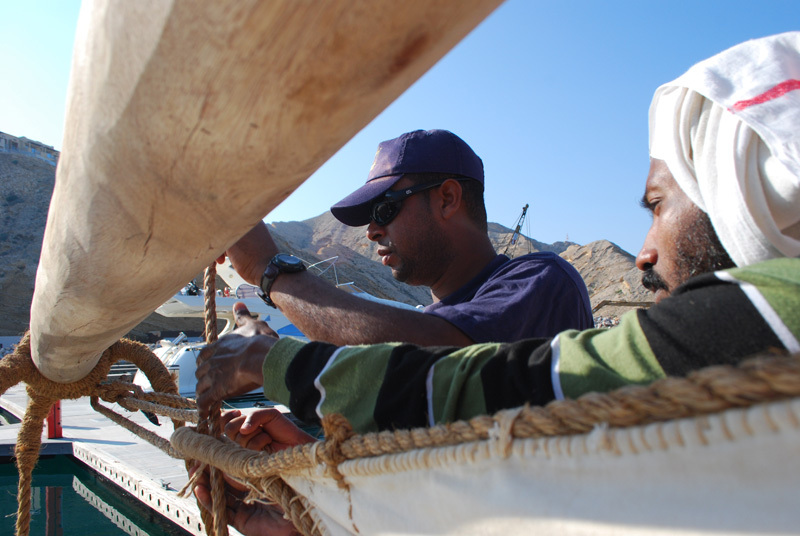 I am from the village of Sidab near Muscat, and my father and grandfathers were all sailors. My father sailed in traditional Omani dhows to Zanzibar and India, and he also worked as a pearl diver in Bahrain. When I grew up I wanted to be a sailor too, so I joined the Omani Navy and served twelve years on the Shabab Oman. The Shabab is a great ship and I enjoyed my work very much. I sailed from Muscat to Europe three times and it was exciting to meet so many people who wanted to see our ship and learn about Oman. The Jewel of Muscat is very different from the Shabab Oman, but I wanted very much to make this voyage to Singapore. Life on board this ship is simple. I like the fresh air and dinking water from “gahelas”. Of course at first my family was concerned for my safety sailing aboard such a small ship, but after awhile they became excited too, and now they are quite proud–just like me–that I am making this trip.